They say you can’t judge a book by its cover… but can you judge a book by its tagline? Of course, it probably doesn’t hurt that each and every book I have read by Kathleen Fuller is AH-Mazing! She writes believably about REAL life! She pulls the reader right into her characters’ world… into their story… even into their head. She writes about tragic events, cautious decision and difficult circumstances – and through it all, she shows that if her characters hold tight to their faith, they can accomplish even the most impossible goals! 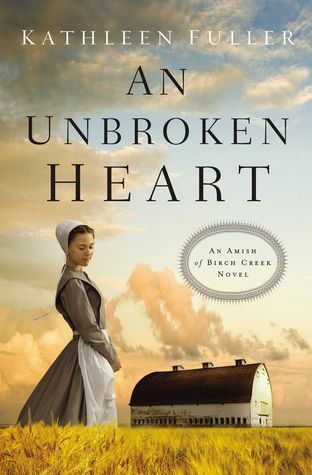 Even wrapped in tragedy, the hope and beauty shines through Kathleen’s latest story: An Unbroken Heart – Tweet this! I hope you’ll give it a chance (of course I always suggest reading a series from the very beginning) – and I really hope you enjoy each story as much as I have! An argument. A crash. In an instant, Joanna’s world is changed forever. One minute, Joanna Schrock was arguing with her parents, and the next, her parents’ lives were claimed in a hit-and-run buggy accident. Her body is broken, but her heart is in even deeper pain — after all, how do you cope with your parents’ deaths when your last words were spoken in anger? After an extended stint in a physical rehabilitation center, Joanna re-enters her Amish life. But nothing is the same — not even her feelings for Andrew Beiler. Joanna has loved Andrew since the age of twelve, and her feelings have not changed throughout the years. She is thrilled when Andrew wants to get married, but she wonders whether it’s love he’s feeling, or pity. As the couple’s wedding date approaches, Joanna isn’t overcome with the deep joy she was hoping to feel; instead, she’s wracked with anxiety and guilt. Joanna hears God whispering to her, Be strong and courageous, but she’s afraid that courage looks a lot like walking away from her dreams and into the plan of her Heavenly Father. If Joanna takes the first step toward healing, will it cost her everything she’s ever wanted? Or could God be changing the desires of her heart?